Welcome to the inaguaral season of Los Angeles Hoopz! 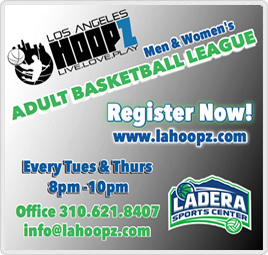 We at LA Hoopz are thrilled to get our first season underway. As the excitement of opening night draws near, I want to post a quick note to remind players of a few things. All teams will be opening their seasons this week. Please arrive 30 minutes early for your first game so that we may take player photos for the web site. Team and individual will all receive an authenic LA Hoopz jersey. Any player whose game day apparel is not in compliance with this will receive a technical foul at the beginning of the game. This technical foul will not, however, be counted against an individual towards a suspension (see below). LA Hoopz strives to hire the best officials available to run our games. We ask all players to be respectful of the officiating crew, regardless of the situation. Our referees have been instructed to “tighten up” the game, similar to the NBA officials, for the season. In other words, excessive arguing of calls will be result in a technical foul without warning. Also, please keep in mind that according to our official rules, all technical fouls will also be counted as a personal foul. Audible foul language, whether directed at an official, opponent, teammate or self will result in an immediate technical foul. LA Hoopz has entered an agreement with our facilities to strictly prohibit any foul language. The accumulation of technical fouls will result in supensions for players. According to the LA Hoopz official rules, Technical fouls accessed to players will result in two (2) free throws plus ball possession to the opposing team. The technical foul will count both as a personal and team foul. UNSPORTSMANLIKE BEHAVIOR IS INTOLERABLE AND AN AUTOMATIC EJECTION IS WARRANTED. Penalty: Any player having two (2) technical in a game will be disqualified from competition. All season the technical fouls will be calculated. If a player has five (5) or more technical fouls, they will have to pay a league fine of $50 and a reinstatement form to compete responsibly. In addition, LA Hoopz has a zero-tolerance policy towards fighting. Any player or players who engage in any sort of physical confrontation will be expelled, without refund, from LA Hoopz pending review. One final note about the officiating: LA Hoopz has hired officials to run our basketball games. Any complaints or questions about the game being played should be directed to the officials in a calm, respectful manner. The LA Hoopz personnel sitting at the scoring table has absolutely no say in the way the game is being played or called. Any complaints being directed to the scorers table will be ignored. If, 24 hours after a game you feel you would like to contact LA Hoopz regarding a specific game situation, we at LA Hoopz will be happy to hear your concern. Please remember that in order to eligible for the playoffs, a player must appear on a teams submitted roster and appear in at least four (4) regular season games. Exceptions to this rule, for instances such as injury, will be ruled on a case-by-case basis by the league office. Please realize that very few exceptions to this rule will be allowed. One final note – LA Hoopz strives to offer the absolute best basketball experience possible. One key feature we offer that no other adult recreational league does is online access to individual and team stats. You can expect your teams full boxscore (as well as recap articles) to appear on our webpage after games. Please, however, be patient and wait for the boxscore to be put on the website. Many players are interested in seeing the stats immediately following the games. In order to protect the integrity of the league, and make it fair for all, no player will be allowed to view the official score sheets following their game. Thank you in advance for cooperating with this request. Now that the technical stuff is out of the way, let’s play ball! I am almost embarassingly excited for this season to get under way. LA Hoopz has made great strides to begin our first season this summer, and we are constantly looking for ways to continue to grow and improve the league. Any suggestions, comments or even complaints you may have are welcome and encouraged at all times. We seriously consider all suggestions (the skill assessment and this blog page were started, in part, to player interest and requests). The best advertising LA Hoopz can have is testimonials from our players. Please, help us spread the word about the league! If you are enjoying your LA Hoopz experience, tell others. If LA Hoopz is not living up to your expectations, please tell us. Good luck to all teams and I look forward to seeing you on the court this week. Have a great season fellas, keep the championship spirit alive in LA. The mamba will be there in spirit.